By popular interest, the votes are in and the Himalayan salt lamp has won the title of Best Natural Health Gadget! Our article last year (10 Reasons Why You Need A Himalayan Salt Lamp In Every Room Of Your Home) was the most popular of the year and resulted in thousands of you purchasing one of these stunning little lamps. Under most circumstances, owning one of these beautiful lamps should be an easy and uneventful process. However, because salt is a natural material and prone to react under certain environmental conditions, problems can arise. In these cases, it may not always be obvious what to do in order to address the issue and avert the potential salty ruin of your precious lamp. After reading numerous questions and comments by our readers regarding the woes of a salt lamp gone wrong, we here at Natural Living Ideas wanted to lend a helping hand and address some of the most common problems which have cropped up for our fans and owners of the beautiful Himalayan salt lamp. 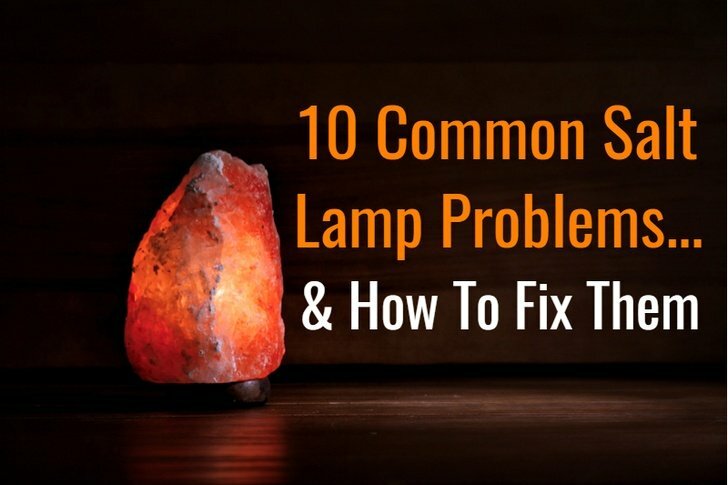 Without further ado, here are ten common problems you might experience with your Himalayan salt lamp and how you can fix these issues. The best way to make sure your salt lamp is safe and that it doesn’t cause you any problems, is to buy a high quality Himalayan salt lamp from a trusted brand. There are a number of high quality lamps available on Amazon, but for reliability and affordability, this Levoit Dimmable Himalayan Salt Lamp with 2 Year Warranty is the top pick. 1. My lamp sweats and it’s starting to melt all over the table. How can I get it to stop? Himalayan pink salt lamps remove contaminants from the air by absorbing the microscopic water droplets which carry them. The hot salt crystal then evaporates clean water back out into its surroundings while keeping any absorbed particulate trapped inside. This process – called hygroscopy – means that sometimes a Himalayan salt lamp is going to sweat. One possible solution is to leave your lamp turned on 24/7. Salt lamps don’t use much energy, so you won’t have to worry about running your electric bill up or hurting the environment by doing so. If you already leave your salt lamp running all day every day, see if you can find a less humid location in your home where the lamp can live. Keep it as far away as possible from wet areas like the bath, kitchen and laundry. You may also want to try using a higher-wattage bulb which will generate more heat and help the water trapped inside the crystal to evaporate faster. Just remember not to exceed the manufacturer’s specifications for maximum bulb strength which should be stamped somewhere on the bulb housing. 2. I’ve tried everything, but the lamp is still sweating. Help? If you and your Himalayan salt lamp live in a climate which is simply humid enough that the salt crystal will always sweat, there are a couple of steps which you will want to take to both lengthen the life of your lamp and prevent any accidents which may occur as a result of the excessive moisture. Also, you’ll want to leave the lamp running 24/7 to evaporate as much of the water from inside the crystal as possible. Use a dry, lint-free cloth to pat the salt crystal dry whenever you notice a large build-up of moisture on the outside. Also, keep an eye out for flickering as this may indicate that the bulb housing has taken on moisture or has become damaged. If you notice the bulb has started to flicker or otherwise malfunction, turn off the lamp and let it cool down, then remove the bulb housing and test the bulb to make sure it’s not too hot to touch. Carefully, remove the bulb and inspect all of the components for corrosion, loose contacts or any other visible damage. If you either cannot find or can’t fix the problem with the bulb housing, you may simply need to replace the cord assembly. 3. I don’t want to turn my lamp off at night because it will sweat, but the light is too bright to sleep with it on. If the lamp is still too bright even when fully dimmed, you could try moving it into a nearby closet or some other area which would shade the light without removing the lamp from your immediate vicinity. If the first two options seem like a hassle, the easiest solution would be to keep the lamp on a coaster, but go ahead and turn it off while you sleep. Should a lot of moisture build-up on its surface, you can always pat the salt crystal dry with a lint-free cloth in the morning when you wake up. 4. I got my lamp, but it doesn’t seem to be affecting the air quality in my home. If you have problems with allergens and your new lamp doesn’t seem to be helping at all, there are a couple of reasons for which this may occur. If the allergens are inside your home’s ventilation system, even a very large Himalayan pink salt lamp likely won’t be enough to counteract the constant stream of particulate flowing out of your air ducts. Consider having your air system inspected and cleaned if necessary. For the average bedroom, a smaller lamp like this 5-8 lb lamp should provide adequate coverage. For open spaces like a living room or den, you’ll want to use a larger lamp like this 8-11 lb lamp. On average, your lamp will need to have 1 pound of salt crystal per 16 square feet of floor space to properly cleanse the air in a room. If you can’t find a large enough lamp for your intended location, remember that you can use multiple lamps spread out around the space to achieve the same effect. 5. My lamp is starting to look dirty. How can I clean it without melting the salt? If your Himalayan salt lamp has been attracting dust and it’s starting to look a bit dingy, no worries! Cleaning a Himalayan salt crystal is easy. Turn off your lamp, unplug it and allow the salt to cool down to room temperature. Then simply moisten a cloth or sponge so the material is damp, but not wet. (A good general rule is to squeeze out as much water as you can before touching cloth or sponge to salt.) Gently wipe away debris from the surface of the crystal and pat dry with a lint-free cloth. Then set your lamp back in its home, plug in and turn it on. Once fully heated, the rejuvenated salt crystal will naturally evaporate off any water left over from its bath. 6. I turned my lamp on, but the light won’t come on. Replacing the bulb doesn’t work. This is most likely a case of broken wiring or contacts somewhere inside the cord assembly. Unfortunately, your beautiful lamp is comprised of a big heavy chunk of hollowed-out crystal powered by a tiny filament inside a fragile globe of glass on the end of some flimsy strands of copper wire sheathed in soft plastic. Should any of these materials get into a scuffle (as can happen when the lamp is moved around)… Let’s just say that in a game of Rock-Powercord-Lightbulb, rock always wins. 7. The bulb in my lamp burns out too frequently. If your frequent burned out bulbs have a smokey white appearance when you remove them, make certain that the next bulb you install doesn’t touching the inside surface of the salt crystal (due to wrong size or length). If water from the crystal runs down onto the hot bulb, it can cause the glass to crack and the filament inside to oxidize which causes the white smoke effect on the glass. If you move your lamp around very often, it is possible that the bulb is getting jostled around and cracked against the inside of the lamp. Again, this could result in broken glass, an oxidized filament and a white smokey appearance on the burnt out bulb. This Levoit Salt Lamp comes with two spare bulbs, just in case the bulb burns out. 8. My lamp flickers on and off while running. If you’re seeing a lot of flickering, this may be a case of a broken wire or loose contact somewhere inside the cord or bulb housing. Turn your lamp off, let it cool down, then inspect the electrical components for damage. A broken connection somewhere in the circuit is a potential fire hazard, so you’ll definitely want to swap out the cord assembly with a new one. If the flickering is accompanied by excessive sweating, this may be indicative of moisture build-up or corrosion inside the bulb housing. In this case, turn off the lamp and unplug it immediately in order to prevent possible electrical damage. Once the lamp and bulb cool down, remove the bulb assembly from the lamp, test the light bulb to make sure it isn’t still hot, then carefully unscrew the bulb and inspect the electrical components. If you notice any water or damage inside the bulb housing, you may need to move your lamp to a less-humid location or use a higher-wattage bulb to encourage faster evaporation. Again, you’ll want to replace the cord assembly if there is any damage. Keep a close watch on your lamp. If the flickering and moisture build-up continue, unplug the lamp and discontinue use as this could indicate a potential fire hazard. 9. I’ve looked everywhere and can’t find replacement bulbs for my lamp. No worries. You’re not alone. The tubular light bulb that came with your lamp probably isn’t one of the regular shapes / sizes stocked by most big-box superstores. While most salt lamps are compatible with a standard small 15 to 40-watt incandescent candelabra (E12) base bulb, we’ll take the guess-work out of hunting for the right bulb at your local retailer. On Amazon, you can pick up a a 10-pack of short tubular 15-watt bulbs here, a 10-pack of long tubular 15-watt bulbs here or a 6-pack of long tubular 25-watt bulbs here. 10. I’ve had it with this salt lamp! It won’t stop sweating and I’m tired of buying new light bulbs! Okay, so this one isn’t precisely a usage or care tip, and calling it a safety tip might be a bit of a stretch. While we may be in love with our collection of Himalayan salt lamps, we understand that not everyone is going to agree with us. So, if you’ve tried them and you like the way the lamps look, but you’ve had so many problems that you simply can’t take it anymore, there is one more solution. Try a Himalayan salt tea light holder instead. They’re just as pretty as a lamp and boast all of the same benefits (albeit on a smaller scale), but without the problems inherent to electrical components in a potentially moist environment. Just remember that if your lamp tended to sweat due to humidity, a tea light holder will probably do the same. You’ll still want to keep a saucer underneath it to protect your furniture! 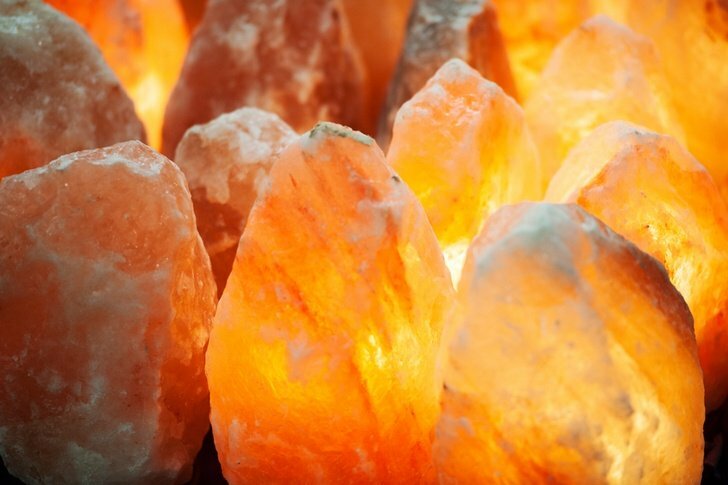 What Is The Best Himalayan Salt Lamp? Some of the problems listed above, namely faulty bulbs and electrical components, can be avoided by purchasing a high quality Himalayan salt lamp from a reputable supplier. It’s surprisingly easy for anyone to start selling products on Amazon so you want to make sure you are buying from a specialist supplier. Without a doubt (based on personal experience and from the reviews left on Amazon) salt lamps from Levoit are the highest quality available. Levoit are specialist suppliers of Himalayan salt products. They sell lamps in a multitude of sizes, they come with a two year warranty and with spare bulbs. To make sure you are buying the best quality salt lamp, make sure you order yours from this page on Amazon.